Performer recently had the opportunity to chat with Onesheet’s founder, Brenden Mulligan, to discuss exactly what his new venture brings to the table, and what it means to independent artists. Onesheet is a service that allows musicians to quickly and effortlessly set up a robust web presence in a matter of minutes building off of existing content from other websites. Users connect their existing social networks and services, and in seconds, they have a website full of content, including music, videos, photos, concert dates, blogs, social streams, mailing list signups, online stores, and more. You’re most well known for founding ArtistData, a service that was acquired last year by Sonicbids. Are you still involved with ArtistData, or have you moved on completely? After the acquisition, I spent an amazing year at Sonicbids but have since reduced my role to more of an advisory one. I’m still actively involved with helping Sonicbids meaningfully integrate ArtistData into their platform when the time is right and constantly communicate with the Sonicbids team. Are you pleased with the way ArtistData’s service has been integrated into Sonicbids so far? Where did the idea for Onesheet come from? I’m a HUGE believer in companies that focus on solving one specific problem. That’s why I was so attracted to working with Sonicbids. They picked one problem and really attacked it, and 10 years later, they’re still the best at it. ArtistData tried to do the same thing. So does Bandcamp, Souncloud, Songkick, etc… Unfortunately, this means that an artist has all their content all over the place. In the past, they would post a bunch of widgets from these places in the mismatched mess that is a MySpace profile. I wanted to help bands be able to utilize all those services in an attractive, simple way without creating more work for them. How are you currently getting artists on board for the service? Word of mouth has been insane. I’m just trying to handle the growth at this point. I was lucky with some really flattering press and a wonderful network of friends and artists who helped to spread the word. Are you still in Beta mode? Yep! Currently, I’m working to add more features to the system without making it feel more complicated. Will be working through that during our Beta. 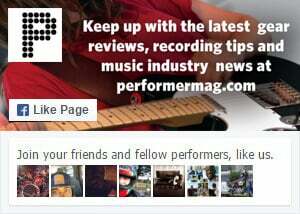 What do you see as the greatest benefits to artists, and those receiving music (like us at Performer Magazine)? It’s a simple, beautiful, and easy to set up web presence that really shows off the brand and is completely maintenance free. If bands have a MySpace page just to showcase media and information, they should take a look at Onesheet. It’s a billion times better. As a follow up to that, a lot of focus has been on fan-to-band communication in Onesheet’s promotional literature. I’m a magazine editor who receives a lot of content daily – do you have any plans to tailor the service for press purposes, or do you see it as mainly a band-to-consumer tool? It’s a band-to-anyone tool. Some bands are using it to send their music to radio stations. Others are using it to try to get press. The intention of the site is a single place where bands can express who they are in a really accessible manner for anyone to come find out about them, be it fans, press, or radio. It’s supposed to be flexible to handle all cases. Some might say that Onesheet only adds to the problem it intends to solve, namely creating one more web presence that artists have to worry about. How do you respond to that? I’d probably say there’s a misunderstanding. Literally when a band sets up a Onesheet, if they never touch it again, it will stay 100% up to date with all their other content. It’s not a web presence they need to worry about. Currently the site’s features remain free, but premium features are set to be released in the future. Can you elaborate on what those features may be? I’m already starting to roll some out experimentally. It will mainly focus on bands with bigger, more specific needs. Currently, suggested advanced features are things like the ability to add a contact tab, greater customization of the Onesheet, adding social triggers for Facebook and Twitter, accessing all the data around the Onesheet traffic, and more. Do you envision Onesheet replacing the need for an artist to maintain a separate website? If so, any plans for domain forwarding? For some artists, it might be enough for their main web presence. For others, it might be a good way to get started before setting up a more fully featured Bandzoogle page (who is one of the supported services). For a different set, it might just be a page they want to set up to help with their overall SEO. Either way, that question should answer itself over time as more artists use it. Oh, and domain forwarding was added this week! Will Onesheet offer artists the ability to add custom content, or will it only pull from existing sites and social network feeds? Right now, it’s hard to find contact info on a lot of bands’ Onesheet pages, for example. The contact tab is part of our Pro service. From our surveys / customer feedback, it seems like there that isn’t a need for a majority of bands, but more the power users. Overall though, Onesheet is focused on only getting content from other places, because otherwise the artist would have to worry about keeping their Onesheet up to date. And finally, you’ve founded several business ventures. What advice would you have for our readers who might be interested in starting their own business? I could write a book on that. And many people have. My main advice would be to start absorbing as much information as possible. Read a ton of books on the matter by people who have either done it, or funded them (Brad Feld has some great books out right now about it). Go to startup meetups. If you’re on a budget, skip the startup conferences, but watch the videos of the speeches. Network as much as possible. When it comes to launching an idea, surround yourself with really smart people. That includes co-founders, investors, advisors, etc. Ask for people’s advice but respect their time. And just f*cking do it. Many people think about it but don’t do it. Do it. It’s so much fun.